"His three most recent Quarry novels, the latest in a series that began in the 1970s, suggest that Collins shared the savvy professionalism of the pulp and paperback-original writers who will be the panel's main subject." 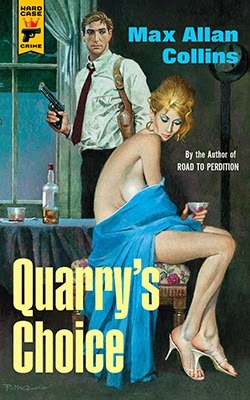 The three most recent Quarrys at the time were numbers eight, nine, and ten, and book eleven, Quarry's Choice, is newly out from Hard Case Crime. How does an author keep faithful readers coming back to a series without, however, boring them? By retaining familiar set pieces, but putting a slightly new spin on each. By occasionally introducing major changes in the protagonist's life without ever deviating from his or her essential character markers. Collins does it again in Quarry's Choice. Quarry readers, for example, will know the character's backstory, how he returned from Vietnam, found his wife in bed with another man, and killed the man the next day. They will be familiar with Quarry's telling of the story near the beginning of each book, complete with the lover's coarse dismissal of Quarry just before his own death, how Quarry wound up being recruited to work as a contract killer. That coarse dismissal is always the same, and it's a pretty funny line, a familiar old friend to readers. And yet the story varies in the manner of telling just enough from book to book to avoid putting readers off. And I like, too, the balance that Quarry manages to maintain between nice guy and the sort of amorality characteristic of a man who kills people for a living. Even when Quarry does the sort of thing to melt one's heart, Collins is savvy enough to infuse the situation with just enough menace to create suspense and tension. 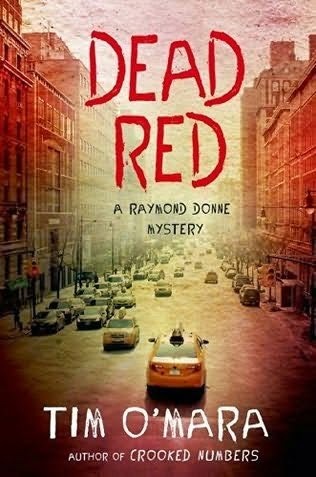 I knew I was likely to like Tim O'Mara's Dead and Red when it opened with the narrator/protagonist not hearing the shot that killed the man sitting next to him in a taxi, and with everything fading not to black, but rather to white as the narrator lapses into unconsciousness. And I like the combination of menace and comedy that characterizes the relationship between the protagonist, Raymond Donne, and a fellow ex-cop. Small touches, perhaps, but the sort of thing likely to keep me reading..
And now your turn, readers: What does professionalism mean to you in crime writing? Forget inspiration and genius for the moment, and just tell me which writers are simply good at their jobs. Wasn't it Mickey Spillane who hated the notion of being called an author? He was he said a writer. And since Collins, I think, is a revivified spectre of Spillane, he qualifies as a writer rather than author. But that leads me to a workable definition: an author might not care about selling books and putting food on the table because he or she is pursuing something intangible; a writer needs to write to make a living, so he better be good at what he does or he will starve. The first name that came to mind as someone who "just did his job" is also a genius; Donald Westlake. He wrote and kept at it like a day job. It just so happened he was better at it than anyone else. The young Elmore Leonard comes to mind. More currently, guys who keep cranking out good material without getting the kind of public recognition they probably deserve include Bill Pronzini, Jack Bludis, Mike Dennis, among others, who consistently crank out good work with appear on bestseller lists. R.T., that sounds like something Spillane would have said. Collins is more than a revivified spectre of Spillane, he was a friend of Spillane's as well as a literary executor, having brought unpunished Spillane manuscripts to light and even completed some that were published under both writers' names. Using your definitions, I would say that, in crime fiction, Donald Westlake was both an author and a writer. Dana, I had posted my reply to R.T. before I read your comment. We obviously agree on Westlake. He was enough of an author to have a head full of ideas, and enough of a writer to turn those ideas into a books. I don't think every one of those ideas worked ("Jimmy the Kid," in the Dortmunder series, for example), but even the misfires are exciting attempts. Hmm, is Mike Dennis a newcomer to such discussions? Ok, Max Collins: yet another guy I've got to read. Thanks, Peter. I've not got enough on my plate. Michael Connolly. Some of his books are better than others--I love the early Bosch novels and consider them a real influence on my O'Keefe books--but every one of his is readable and kicks up some fact or scene or bit of dialogue that sticks with you. And Connolly does with Bosch and his back story what you've described Collins doing. I've done it, admittedly only once, and it's not easy. Oh, and Waumbaugh with his Hollywood Station novels. A pure 'pro'. A professional is a writer/author good enough to balance the absurd, violent, hilarious and poignant and make it all ring true. Waumbaugh down to the ground. Willeford is one who does (did) this so well. RIP. I'm an author, a dilettante amateur, by the by. No writer, me. If I had to write to eat I, and those nearest and dearest to me, would be eating intangibly! Cheers! I am so glad I checked in on your blog today. I wasn't aware of these two writers. As is my custom, when I am introduced to a new author, I check them out on Stop You're Killing Me and Amazon. Anyone who has a line in a book that describes one of the characters looking like Gabby Hayes dressed up for the prom, like Max Collins did, has me hooked. He also mentioned Donald Westlake in his author's notes. He said, "Over the years Quarry has built a cult following (I always caution enthusiastic readers to remember the Donald E. Westlake definition of a "cult" success: "Seven readers short of the author making a living")"
I know it is environmentally correct to build homes insulated with straw bales these days. I wonder if it's possible to do it with books? These books will put me close to finding out. This also gives me a chance to compare a book and the movie. I haven't read or seen The Road to Perdition. Kevin, I've read a small portion of Collins' vast output, but it's worth reading a bit about him just to get an idea of where you might want to start. The Thrilling Detective Web Site has a good entry on him, and so does the Rap Sheet. I like Collins' Quarry novels, and Road to Perdition is pretty good, too. Collins was on my panel to discuss writers of the pulp and paperback original eras, so I didn't have to read much of his own work is preparation. Bit the Quarry novels were so much fun that I read all ten that had were available at the time. I don't think there are many writers who turn out as much as some of the old guys did, with their scary takes of writing a million words a year. But Collins comes close, and he went to the University of Iowa Writers' Workshop, no less. He was a kind a townie, from Iowa himself, and not a hipster from New York. And he made Iowa a big part of the landscape in those early Quarry novels, which apparently was unusual for the time. Mary Beth, I like that Gabby Hayes description. Who is the character in question? Collins acknowledges Westlake as a kind of mentor, and signs of this will be obvious to readers who have read a bit of Westlake. The Gabby Hayes description is in Quarry's Ex. It is in reference to an old acquaintance called Jerry whom he meets in the casino. I read that in the fall. It's such a great description; I wonder why I failed to recall it. I wonder how many readers will recognize Gabby Hayes' name. I probably know only because George Carlin mentioned him in a well-known routine. I like IMDb's description of Gabby Hayes as "the most famous of Western-movie sidekicks of the 1930s and 1940s." George Carlin mention Gabby Hayes as he (Carlin" mused on the difference in tone between the evil "beard" and the kindly, rustic "whiskers." "Gabby Hayes had whiskers," Carlin said. Glad to have been part of this fun discussion. One thing -- the Gabby Hayes line in part reflects that the Quarry novels have -- unusually -- become period pieces. The original novels were written in the early to mid-'70s, with one more mid-'80s. I was asked to do another by Hard Case Crime a few years ago and ended the series with THE LAST QUARRY, the character much older now. When the positive response to that novel indicated I might be able to do more stories with Quarry, I went back to the '70s/'80s period to do them. So references by Quarry to pop-cultural, political and other aspects of those years reflect the time in which they're set. I am the only writer on the planet, by the way, who can count both Spillane and Westlake not only as influences, but mentors. Max, thanks for weighing in. I noticed the period-piece aspect of Quarry's Choice in the descriptions of clothing. I don't think I had previously read a crime novel that mentioned leisure suits more than once. A fair amount of Ban-Lon in there too, if I recall correctly. You picked some good mentors, which puts me in mind of Road to Perdition, with the son accompanying the father and learning from him. Somebody stop me before I write a thesis.